Swifts Meats For Babies 1953 ad. This color January, 1953 ad states all babies need lots of protein and heres where they can get more. Ounce for ounce, heres 5 times more protein than the usual babies meat soups supply. Picture sows baby crawling with phone receiver in hand. A Red Checkered toy horse is setting by baby. Magazine tear sheet picture is taken through plastic and may show wrinkles or crookedness that is not in the ad. This Original magazine tear sheet measures 8 inches wide by 11 inches tall. 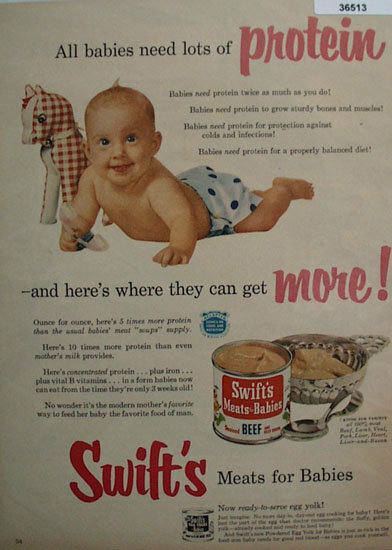 Items Similar To "Swifts Meats For Babies 1953 ad"
Swifts Brookfield Pure Pork Sausage 1947 Ad.